Everyone needs a zombie. Now you can have one of your own! These cute little guys are great for necklaces, to hang in your car or in your home. They’re tiny and they hardly bite. 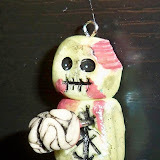 Click on this little guy below to see the photo album of zombies. Mind your brain.